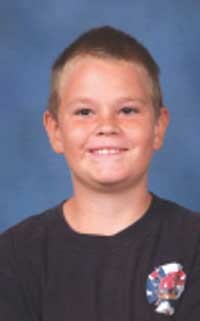 Lincoln County authorities have determined that a 10-year-old Dietrich boy died late Saturday afternoon from "self-inflicted strangulation" after playing a "choking game" alone at his home. Deputy Coroner Mike Bright said emergency medical personnel struggled for 47 minutes to save the life of Austin Harold Rasmussen before he was pronounced dead at 5:57 p.m. Saturday. Emergency responders were called to the home at 5:10 p.m. after Rasmussen was found alone and not breathing in his bedroom. "What had happened was Austin strangled himself playing the choking game and was unable to recover," Bright said. "This game is very deadly. There have been a lot of kids die from this. It should not be played at all." Bright, who is also a supervisor with Lincoln County Emergency Medical Services, said that officially, Rasmussen's cause of death was "strangulation, which led to respiratory arrest, which led to cardiac arrest." Rasmussen, a fourth-grader at Dietrich School, is the son of former Bellevue residents Brandon and Stephanie Rasmussen. So-called choking games, sometimes referred to as fainting games, are defined as intentionally shutting off the supply of oxygen to the brain with the goal of producing a temporary high or euphoria. According to GASP, an acronym for "Games Adolescents Shouldn't Play," an organization founded by families of choking game victims, the activity leads to "thousands of kids dying or suffering permanent brain damage each year." Choking can be accomplished by ropes, sheets, collars, hands or even by hanging. GASP reports that many people don't know how deadly the game can be. Bright declined to discuss what method Rasmussen used to strangle himself, but noted that the boy was home alone in his bedroom at the time. "He was not playing with other kids," Bright said. "He was the only one in his room. Without other people being present, it's difficult to come back." Bright said emergency responders from the Dietrich Quick Response Unit, Lincoln County Emergency Medical Services and Air St. Luke's in Twin Falls rushed to the home but were unable to bring about recovery. Bright said Rasmussen apparently heard about the choking game from older students at Dietrich School. "Parents should talk to their kids and discuss having them not even think about doing it," Bright said. "It's quite common in bigger areas. It's such a strange deal, though, for Southern Idaho." He said the game was popular several years ago, "then faded away, but now it's coming back." Blaine County Sheriff Gene Ramsey said the last choking game incident he recalls in Blaine County was about 10 years ago when a man died in Hailey after choking himself with a dog collar. The collar was supposed to release once the man passed out, but it didn't. According to GASP, indications that someone is engaging in the practice include suspicious marks on the neck, changes in personality, headaches, bloodshot eyes, or ropes, straps or belts lying around for no apparent purpose. Funeral services for Austin Harold Rasmussen are scheduled for 2 p.m. Friday at the Dietrich LDS Church. Visitation will be held from noon until start of services. Burial will follow at the Shoshone Cemetery. Services are under the direction of Demaray Funeral Service -- Shoshone Chapel. A fundraiser to help the Rasmussen family is scheduled for Thursday from 5-8 p.m. The event, a chili feed, will be held at the Lincoln County Community Center in Shoshone.